These crochet blanket patterns are quite easy to work up. Although I usually like to make smaller items, occasionally I get the urge to crochet a blanket! But I don't want to spend too long on it - hence the simplicity of my designs below! Found some fab baby yarn - so decided to make a blankie! Worked in rows of dc (UK tr) and with a simple edging, this little blanket would make a great gift. You can vary the size of the blanket, too, and I tell you how at the start of the pattern. 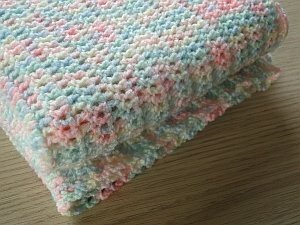 Here's a fun blankie for baby with a pretty shell edging. Crochet it with or without the stripe (see my pix of the stripeless version) from the bottom up using dc (or trebles, for UK pattern-readers.) I include all the row stitch-counts so you always know where you are, as we increase, increase, increase a bit more... then shape the two top parts of the heart with decreases! 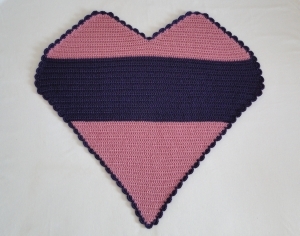 Makes a lovely Valentine baby gift, or just an "I love you" gift at any time of year!